If you are a visual business such as art, interior and exterior design, or photography, then magnetic picture frames are perfect promotional materials for your business. With the ease of photography nowadays with smartphones, taking a snapshot of everyday moments are prevalent and make this a promotional tool for any business. A custom magnet frame with your company logo and information not only is a great promotional gift but also a fantastic way to associate your company with good times and happy thoughts. 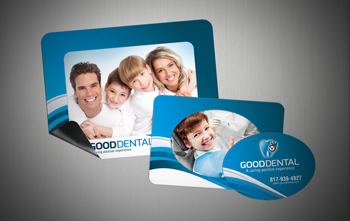 Create a great promotional frame with NextDayFlyers. We provide a fully-customizable product printed on recycled materials. Our 3-in-1 frame pops out into 3 different sizes depending on your preference. As a large frame, you can fit 3.5" x 5" and 4" x 6" photos. As smaller frames, it can hold 2.125" x 3.25" wallet size photos, and as a round business card magnet where you can print your company information. The large size comes with rounded corners and protective laminate coating for durability. A custom magnet frame with your logo on it is a great company gift and a fantastic way to associate your company with positive moments. After all, everyone can use them to put photos of their favorite dog, cat, child, wedding snapshot, etc. in. Here are some of the businesses that work especially well with our 3-in-1 magnetic picture frames. Give a picture frame freebie to your customers to showcase the photos you took of them. Wacky family photos posted on walls and fridge doors can remind your clients of their happy moments taken by a professional. et lovers will always give their pets the special treatment. What better way to show their newly-groomed pets than a photograph of their pet? Give them as a freebie with frames for people to add their pet pictures and give customers a reason to choose your business over another. Special events can be even more special when there is a souvenir to remind people of the fun times they had. Give magnet frames away as part of your party package. Create a colorful design for kids parties or an elegant one for corporate events. The attendees will be grateful for it.